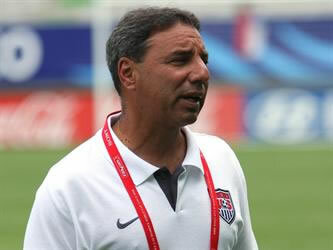 Tony DiCicco was the President, Founder and Technical Director of SoccerPlus Goalkeeper School and SoccerPlus FieldPlayer Academy. Sadly, he passed away in 2017. Tony was the former Head Coach of the US Women's National and Olympic Soccer Teams and the Head Coach of the US U20 Women's National Team. In 2008, in his return to international soccer, he coached the US to the FIFA U20 World Cup Championship in Chile. He had previously lead the Full National Team to the 1999 FIFA Women's World Cup Championship, the largest women’s sporting event in history. And in 1996, he coached the US Women’s Olympic Team to the first ever Gold Medal in Women's Soccer. Tony was raised in Wethersfield, Connecticut and attended Springfield College in Massachusetts, where he became an All-American Goalkeeper. After college, he had a distinguished professional career throughout the 1970s in the American Soccer League (ASL) with the Connecticut Wildcats and Rhode Island Oceaneers, while simultaneously teaching Physical Education in Bellows Falls, Vermont. In 1973, he played for the U.S National Team. He also earned a Masters from Central Connecticut State. University, as well as his United States Soccer Federation "A" License and the Advanced National Diploma from the National Soccer Coaches Association of America. In 1991, then-Head Coach of the US National Team, Anson Dorrance brought Tony in as a Goalkeeper/Assistant Coach. He traveled with that team to the first Women's World Championship in China. Two years later, he was brought in as an Assistant Coach for the U.S. U20 Men’s World Cup Team who competed in Australia in 1993. When Dorrance stepped down as Coach of the U.S. Women's National Team, Tony was appointed as the Head Coach and remained in that position through three World Championship events, the 1995 Women's World Cup, the 1996 Olympics and the 1999 Women’s World Cup. After winning the Bronze medal in Sweden in 1995, the US Women won the next two events, both on US soil. The 1999 Women's World Cup was the largest women's sporting event in history, with the final drawing 90,185 people to the Rose Bowl in Pasadena and an estimated 40 million television viewers. 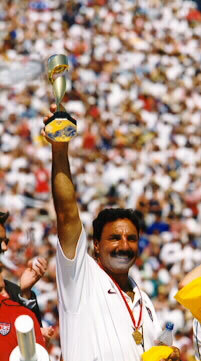 Following the World Cup in 1999, DiCicco resigned with an overall record of 103-8-8, at the time the highest winning percentage in US Soccer History. He remains to this day, the coach with the most victories all-time. During his tenure, the U.S. Women’s National Team won 5 Consecutive US Cup Championships and the 1998 Pan Am Games. Following his retirement from US Soccer, Tony became the founding Commissioner of the Women's United Soccer Association (WUSA) from 2000-2003. Following the WUSA's suspension of operations, DiCicco remained an outspoken and strong advocate for the need of a women's professional league in the United States. He worked as a TV Analyst and color commentator for NBC during the 2000 Olympics and ESPN during the 2003, 2007 and 2011 Women's World Cups, as well as other various events. In 2003, he founded a youth club in Connecticut, SoccerPlus Elite, where he served as both the Technical Director and a coach for various age groups. To supplement the on-the-field training for SoccerPlus Elite and other local student-athletes, DiCicco founded the SoccerPlus Education Center, a 501(c)(3) not-for-profit organization whose mission is to "enrich lives through soccer." In 2006 he became the Technical Director for the adidas ESP Program and the Director of the Goalkeeper Institute for the NSCAA where he also served as a Senior National Staff Coach. In addition, at various times he served on the USYS Region I Staff for both boys and girls. To create a top of the pyramid for SoccerPlus, in 2007, he became the owner and Head Coach of the SoccerPlus Connecticut Reds of the WPSL and in their inaugural season, the team won the US Women’s U23 national championship. In 2008, in his return to international coaching, he coached the US U20 Women's National Team to the FIFA World Cup Championship in Chile. The USA's first championship in the event since 2002. He served as Head Coach for the Boston Breakers of the WPS from 2009-2011. DiCicco also served on a Technical Advisory board for U.S. Soccer along with former National Team coaches Anson Dorrance, April Heinriches and former National Team player Carin Gabarra. He is survived by his wife, Diane and their four boys – Anthony, Andrew, Alex and Nicolas. I am immensely grateful for my friendship with Tony and his family since my time as a Staff Coach and then Director for SoccerPlus Camps. Tony's steadfast and early-on support of the Soccer Parenting Association pushed me forward, motivated me with my mission and encouraged me to keep going. Like the thousands and thousands of other coaches across the world who were lucky enough to cross paths with Tony, my life was enriched and I was taught valuable lessons in the power of sport to transform lives. I am honored to have a few of the interviews I did with Tony and a couple of his articles as part of SoccerParenting.com and MySoccerParenting.com.